At ePromos, we offer an extensive range of sturdy and reliable custom clipboards. These useful promo products are designed to not only improve visibility and brand awareness, but also enhance productivity too! They’re the perfect way to get your company name in front of your clients, while serving a crucial need within your office. 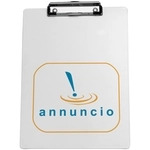 Our promotional clipboards are a popular feature of many established business operations. Ideal for meetings, tradeshows, and even company events, these promo items are perfect for ensuring a memorable first impression among employees and clients alike. Logo clipboards might not seem like the most exciting promotional product in the world, but they're an essential part of your day-to-day operations, and one of the simplest ways to spread brand awareness for your company. Whether you're in charge of a crucial trade show logistics, or you're hosting an event, a promotional clipboard can be the perfect way to highlight the value of your company, and embed your brand logo into the minds of your customers. With these handy promo products, you can make a lasting first-impression wherever you go. Either by dishing them out among your sales representatives and employees, or showing them off when you're taking part in an important industry conference. With your name and logo printed on a robust, customized clipboard for all the world to see, you'll build a reputation as a brand that puts quality and reliability first. No matter the style you're searching for, ePromos has the ideal product for your preferences. We provide solutions that range all the way from letter-sized to full-color, to 2-in-1 microfiber portfolios and more! We offer a range of imprinting methods including screen printed, pad printed, and hot stamped. We also offer full four-color process printing to display your logo or brand name in vivid color. No matter your background, industry, or requirements, we'll help you to find the perfect item for all your branding and productivity needs. You may wish to hand these items out as gifts to your most valued customers. Having your logo on hand nearly ensures they won’t forget your name anytime soon. Or, give each employee one to build brand awareness when they’re communicating with clients and customers. Knowledge is key in any business, and these unique, effective promotional products will help you keep all the information you need within your grasp. Reach out for help from one of our exceptional trained consultants today, and find the personalized clipboard that's best suited to you!